FISHERMEN SOMETIMES have ideas or opinions about the marine environment that do not stand up to scientific scrutiny. For example, many anglers believe that changes in barometric pressure strongly influence fish behavior—most notably their willingness to cooperate with anglers. Some have even written that fish can detect a change in barometric pressure before it occurs. An interesting notion, perhaps, though in almost all instances it is incorrect. A rise or fall in barometric pressure, such as with an approaching cold front, usually means a shift in the weather pattern. And it is the change in the weather, not any fluctuation in barometric pressure, that affects both the fish and the fishing. In fact, most saltwater species probably aren’t even aware of barometric variations. Pressure, whether in the air or in the ocean, is expressed by scientists as units of “atmosphere.” One atmosphere is defined as the pressure caused by the weight of all the overlying air at sea level—or 14.7 pounds per square inch (psi). Atmospheric pressure is often called barometric pressure because it can be measured by the height of the mercury column in a barometer. Changes in barometric pressure, therefore, indicate capricious weather. In general, low-pressure systems bring unstable conditions, often with precipitation and clouds. A rising barometer means high-pressure is approaching, the harbinger of stable and clear skies. How much do fish respond to these day-to-day fluctuations? Consider that a normal value for barometric pressure is about 30 inches. Strong high pressure is about 30.70 inches. A powerful low, such as during a hurricane, can reach down to 28 inches or less. The difference between these two extremes (2.7 inches of barometric pressure) is equal to about .09 atmospheres. The barometric pressure difference from a simple passing cold front is only about .06 atmospheres. The rate of a falling barometer also tells us how fast a low-pressure storm is approaching. A slow-moving storm would have a dip of about .02 to .03 inches of barometric pressure per hour; a fast-moving storm will drop the barometer about 0.05 to 0.06 inches per hour. Simply stated, barometric pressure does not change quickly enough to magically turn the bite on or off. It certainly is one of the ingredients in the overall weather process, but temperature, cloud cover, wind direction and speed, and humidity can also affect fishing conditions. More importantly, the rate and amount of change in barometric pressure is insignificant compared to what’s going on below the surface. Pressure in the ocean, called hydrostatic pressure, increases with depth due to the weight of the overlying water. Water is almost 800 times denser than air; thus, hydrostatic pressure increases much more rapidly than atmospheric pressure. If you swim or dive just a few feet below the water’s surface, you feel this rapid increase in pressure. At a depth of just 32.8 feet in the ocean, the hydrostatic pressure is equal to the pressure from the entire weight of the earth’s atmosphere as measured in pounds per square inch. In other words, at 32.8 feet, the total pressure, due to the weight of both the atmosphere and the water, is two atmospheres. At 65.6 feet it’s 3 atmospheres, and so forth. Fish can tolerate hydrostatic pressure because they have a swim bladder containing a volume of gas, which they adjust to equal their environment. This enables most fish to comfortably make small and quick up or down movements in the water column. In the ocean, four main factors can change the hydrostatic pressure in the fish’s world. First, a fish naturally changes pressure around itself by making movements associated with feeding, swimming about, avoiding predators or trying to loose a hook. A small move can result in a relatively large pressure variation. For example, going up or down just 3.28 feet will decrease or increase the pressure on a fish by 1/10 of an atmosphere. One tenth of an atmosphere exceeds any reasonable change that might occur due to a fluctuation in barometric pressure. Equally important, when barometric pressure rises or falls, it can take more than a day to equal the change in hydrostatic pressure that a fish experiences in seconds during its normal up or down movements. Second, tides can alter hydrostatic pressure. Assuming the fish stays in the same position, even a small three-foot rise in tide will increase the hydrostatic pressure by about 0.09 atmospheres. A low tide would decrease the hydrostatic pressure by a similar amount. Thus, within about a six-hour period from high to low tide, a fish would experience a fall of about .18 atmospheres of pressure. This is about twice what could be expected from the barometric pressure going through a major drop during a hurricane. Third, waves make rapid and continuous changes in hydrostatic pressure. Two-foot waves, for example, will produce a change in pressure of about .06 atmospheres. This rapid change correlates to the period of the waves—about four to six seconds. Higher pressure comes when the crest passes; lower pressure occurs under the trough. When a storm approaches a coastal area, the waves, and the increase in hydrostatic pressure, will be considerably higher than during calm-weather periods. The weight of the air itself is the fourth influence on hydrostatic pressure, but its effect is quite gradual. Barometric pressure associated with a major storm will dip (depending on the system’s rate of speed) by only .002 to .02 atmospheres per hour. This gives fish considerable time to make any necessary adjustments. 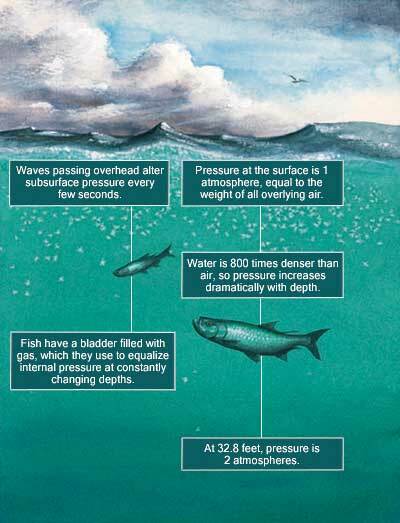 When compared to the effects of the tide, waves, and normal movements of the fish in the water column, changes in hydrostatic pressure caused by barometric-pressure are trivial for saltwater fish. Even a dramatic change in the barometer will be lost to the everyday pressure changes experienced by fish under normal oceanographic conditions. It’s a happy notion that one could simply consult the mercury column each morning to know whether it’s a better day for work or fishing, but it’s unlikely that barometric pressure alone can trigger the sudden bite that angling’s common wisdom often asserts.